Motoko Kusanagi is the mysterious, even enigmatic woman who has led a group of SpecOps for years and was recruited by Aramaki to work for Section 9. Almost nothing is known about her, her origins, birthdate and etc. She could not be older than 60 or so since the widespread use of full-cyborgization was not in use until then. She was fully cyborged at a very young age and as she "grew" she went through a series of artificial bodies. This, more than anything, likely contributed to her great ease at controlling cyborg bodies of various types, even multiple at the same time. More mysterious is her incredible ability as a hacker, as she is equally at ease in a cyborg body as she is without one while diving the net; she is also officially registered as a Super Wizard Class Hacker. Her romantic life does not officially involve anybody in the Stand Alone Complex series; however, in the original manga she is bisexual and dates the leader of Section 1 for some time. In the SAC universe,​ it is shown in that Hideo Kuze is the first person she ever loved, and her relationship with Batou seems to be one of a close platonic trust. Whatever her age, Major Kusanagi now prefers the body of a 20-something woman. She is most often identifiable by her short violet hair and violet eyes in her Stand Alone Complex design. 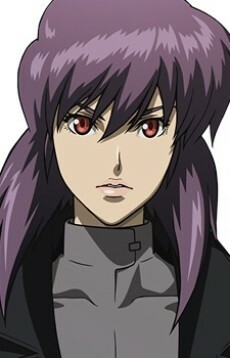 Her Arise design features her with short, indigo hair and blue eyes and features the Major at a younger age as she fights for her autonomy from Unit 501 of the Army.